Pete and I would like to thank everyone that came out and took time out of their very busy schedules to help us this weekend at Orangeman Triathlon. We know that your time is very valuable, and coming down to help out at very early times in the morning, until late afternoon while you have other things and priorities means a lot to us, and we so appreciate it! Thank you Thank you! The athletes appreciate it as well, and it really would not be a good race without the help form everyone. You all did a fantastic job! Just wanted to post a couple of photos and say what a great time we all had going up to Noble Canyon and spending the day running there. Donna, Tom and I all finished and got some quality miles in! My feet are pretty messed up with blisters and bruised toes, i think i may loose half my toenails, but other than that, i feel good. Pete was a great support all day, and was able to get to most aid stations pretty easily. So If ever you want to do a race, this is a tough, but beautiful course. We can either get cabins, or camp, and would all have a fantastic time! For this weekend, Saturday...You guys will meet at 8am and start from Ridgepark to do a 9 mile (ish) course. There will also be a shorter course option. Sunday we will be at Orangeman, so no class! Hopefully most of you will be with us volunteering, and you can run with runners handing out water to get your miles in. :) HEE HEE! 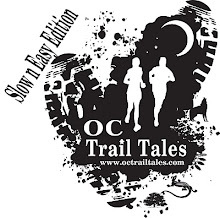 Please wear your OC TRAIL Tales shirt for the Aid Station on Sunday if you are volunteering. Just a reminder that this weekend we have Noble Canyon 50k, so we will not be having class Saturday or Sunday. Saturdays class is meeting at the community center in Laguna Hills to do a 12 mile run, of course those of you who dont need 12 miles, can always modify that. Next Sunday is Orangeman Triathlon, and we are really looking forward to getting our hands dirty, and learning how hard it is to put on a race. We are always looking for volunteers, so if you are so willing to give your time, you would be greatly appreciated, and you even get a free shirt! :) Let us know and we will mark you down. We need people from 8am to 5pm for the run course, so whatever time you can give would be greatly appreciated. We have a great OC Trail Tales site. Save the Date Dec 11th! Join the OC Trail Tales Team at this Awesome Event. Start training with us on Saturdays at El Moro. Check out our Training Calendar. The race features two distances - an introductory 5k trail run and a longer 17k trail run for the more experienced runner. This all takes place on fire roads and single track trails in the El Moro area of Crystal Cove State Park. Race field is limited, so enter early.